Outrigger House is great for groups or families that want to have tons of space under one roof. There are four bedrooms and each has large, glass doors allowing you to soak in the breeze. The family room is a great place for everyone to gather, and the upstairs has a wraparound balcony so you can peek over to catch a glimpse of the family room activities. With so many outdoor spots to kick back and relax, your guests will have plenty of choice between the indoors and out. Beautiful harbor and town views!! Outrigger Villa is located on a ridge in an exclusive, residential area. 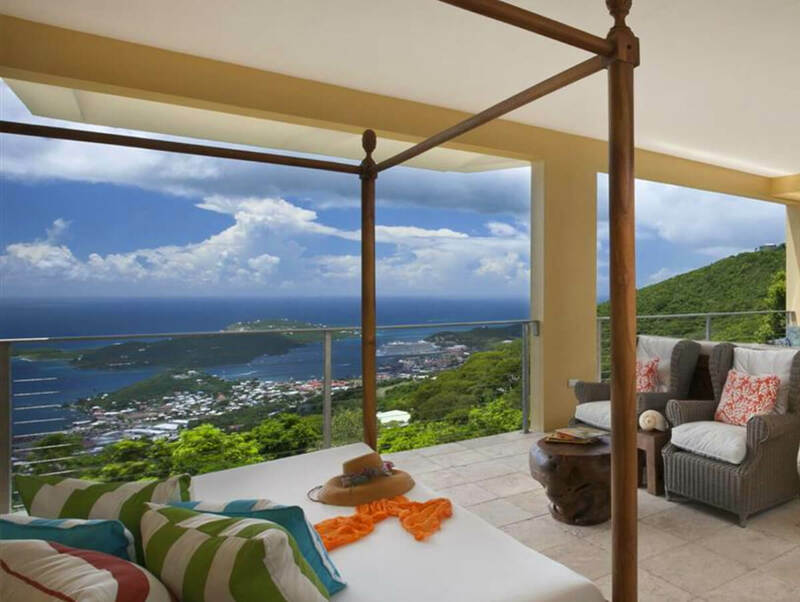 This private home affords views of Charlotte Amalie harbor and the neighboring Water and Hassel islands. With an electronic gated entrance and a spacious parking area, this home is luxurious from the start. The infinity pool, Wi-Fi, and lounge chairs are incorporated in over 5,000 square feet of outdoor space. Weddings, corporate retreats, birthdays, and any special celebration can be hosted on the terrace. There’s a Weber grill, garden seating, and trees with tropical fruit for amazing al fresco dining. The exercise studio is below the pool deck and has a private bathroom, dumbbells, yoga mats, and Pilates exercise balls. Caribbean breezes flow through the property, thanks to an open design and vaulted ceilings. The living room has 25 foot ceilings, a Bose sound system, and comfortable seating. Eight guests can sit around the dining table, and there’s plenty of outdoor seating under the 75 foot-long veranda. The kitchen is fully equipped with a six-burner Viking gas stove/oven, a French-door refrigerator, a dishwasher, a coffeemaker, a blender, and other standard appliances. It also has a breakfast nook and a wet bar with a wine cooler. Upstairs, there’s a media room with a flatscreen HDTV and a Blu-Ray/DVD player. Each bedroom has its own air-conditioning system, flatscreen TV, private terrace, walk-in closet, and ensuite bathroom. There are four equally sized king suites, one of which is on the ground floor. The other three are upstairs. There’s also a studio apartment with a queen bed, a kitchenette, and a bathroom. Outrigger Villa has easy access to St. Thomas’ historic downtown district, the waterfront, and French Town. There’s duty-free shopping, beaches, a golf course, water sports, and the airport nearby. Upon arrival guests will secure their rental car and drive to the villa using directions provided.